You’ve no doubt heard of the Four Horseman of the Apocalypse. Moving with vision, speed, and determination in the opposing direction are the Four Partners of Economic Development. 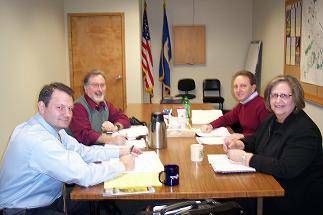 The executive directors of the partners (the Chamber of Commerce, the Economic Development Authority, the NDDC, and the Northfield Enterprise Center) kicked off their regular meetings for 2009 by getting together earlier this week. From left to right are Jody Gunderson, EDA, Ross Currier, NDDC, Blake Abdella, NEC, and Kathy Feldbrugge, Chamber. Topics on Tuesday included following up on the recent series of summits on In-fill and Redevelopment, moving forward on the review and enhancement of Northfield’s Economic Development “Toolbox”, consideration of a Market “Re-Analysis” and “Re-Targeting”, a customization of the University of Minnesota Extension Service’s Retail Trade Analysis, and collaborating on a “Shop Local” campaign. Roles and responsibilities were discussed and action steps for the next two weeks were set into motion. There is a sense of urgency driving our work. We are all optimistic that the times are right for meaningful positive changes in Northfield.